The name Bowman Chrome has become synonymous with Collectible Rookie Cards and this year's football offering is the best one yet. The base set is fueled by 30 different Autographed Rookie Cards (1 per box) including the super-hot Carnell "Cadillac" Williams, #1 pick Alex Smith, Braylon Edwards, Aaron Rodgers, Mike Williams, Ronnie Brown and Troy Williamson. This can't-miss rookie product is a must have for all Rookie Card collectors. 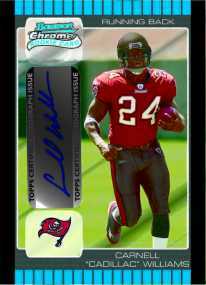 2005 Bowman Chrome Football releases the week of Dec. 19 and carries a $4.00 SRP for each 4-card pack.